Quick! What do you say when someone tells you that your entire body is covered in bacteria? If your answer was A, you’re not alone, but your gut would certainly disagree. That’s because, as Martin J. Blaser, MD, describes in his new book Missing Microbes, the bacteria that coat your skin, inhabit your mouth, and fill your intestines are essential to your health and well-being. They protect you from harmful pathogens, help digest your food, produce vitamins, and fine-tune your immune system. Unfortunately, Blaser explains, we have not been giving these essential partners the respect they deserve. For the past 75 years, we’ve been bombarding them with antibiotics without realizing that when we were shooting at the bad guys, we were also hurting the good guys. And the rising incidence of chronic conditions from obesity to asthma to allergies may be the price we are paying. The trillions of microbes that make their home on the human body–known as the human microbiome–are not a random collection of bacterial passers-by. Instead, the particular kinds of bacteria, the sites of the body they occupy, and the functions they carry out are the result of hundreds of thousands of years of evolutionary selection. All the life forms we see around us–plants, insects, mushrooms, fish, mammals–evolved on a planet where life was entirely microbial for billions of years. We may think of evolution as a process of “higher” life forms leaving these “primitive” organisms behind, but in fact, every multi-cellular organism has a group of microbial partners that provide it with various selective advantages. 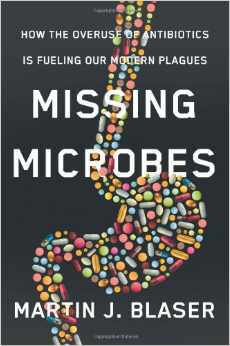 There are a million wonderful stories to tell about these microbial partnerships, but Blaser’s book focuses on the one between humans and our microbiome, and the unintended consequences of one of humanity’s greatest inventions: antibiotics. Blaser doesn’t deny the stupendous, life-saving power of antibiotics. He doesn’t argue that we should stop using them. However, he shows how our indiscriminant use of antibiotics has both societal and personal costs. At the societal level, antibiotic use selects for antibiotic resistance, leading to the emergence and spread of drug resistant bacteria like MRSA (multi-drug resistance Staphylococcus aureus). Where Missing Microbes blazes a new trail is in showing that this often “just-in-case” antibiotic use may have considerable consequences for the health of the individual. Indeed, Blaser argues that many of the chronic diseases that have exploded in the last 30 years, including obesity, asthma, juvenile diabetes, food allergies, and gluten intolerance, may be triggered, made more severe, or both, by repeated antibiotic assaults on our microbiomes. How can all of these different diseases be connected to antibiotics? What ties them together is the intricate communication network that has evolved between humans and our partner bacteria. The bacteria in your gut help digest your food, and secrete chemicals that tell your body when you’re full–a change in the composition of your gut microbes thus could contribute to weight gain. Elaborate conversations between your resident bacteria and your immune system calibrate whether the immune system springs into action or ignores a passing threat. Could breakdowns in that conversation lead to inappropriate inflammatory reactions like food and ragweed allergies, or conditions where the immune system mistakenly attacks our own cells, like juvenile diabetes? The stories are complex, and as Blaser readily admits, many of connections between antibiotic use and disease remain correlative, with the causative mechanism still unclear. However, the correlations are strong, and the consequences serious. 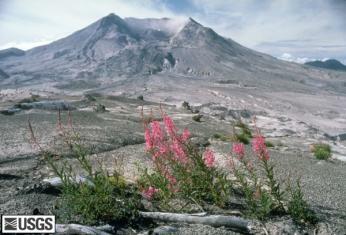 An analogy that works for me is this: remember when Mount St. Helens erupted back in 1980? Pictures immediately after the eruption show a barren hillside, but over the next years and decades, the forests that had covered the mountainside before the eruption returned. What would have happened, however, if the mountainside had been sprayed with a strong herbicide one month after the eruption, then again 6 months later, and again in a year? Would it be likely that the ecosystem that emerged would be the same? Some of the more rare and delicate plants might not have survived, while tougher and weedier plants took their place. Insects or birds depending on the rarer plants would not return, and overall biodiversity would probably suffer. According to Blaser, 258 million courses of antibiotics were prescribed in the United States in 2010. On average, American children receive three courses of antibiotics before their second birthday. What is this doing to the diversity and resilience of their microbiomes? Which critical conversations between their microbes, their metabolic pathways, and their immune systems, are being interrupted or even lost permanently? The exciting research now taking place to understand our microbial partners will eventually begin to answer those questions. In the meantime, Blaser argues, we urgently need to reconsider the idea that taking antibiotics has no cost, and take them only when absolutely necessary. Evolution dictates that pathogens will be ever with us, and the need for antibiotics will not disappear, even if we get much better at recruiting our own microbes to help deter the bad guys. In the future, the goal will be to develop highly specific antibiotics that kill only the bacteria causing infection, coupled with rapid diagnostics so that doctors can prescribe these“precise” drugs. With a more sophisticated arsenal for fighting the minority of bacteria that make us sick, we will be able to take better care of the trillions of bacteria that keep us well. That’s worth a “Yay!” don’t you think?